Thoughts of a computer scientist focused on electronics. 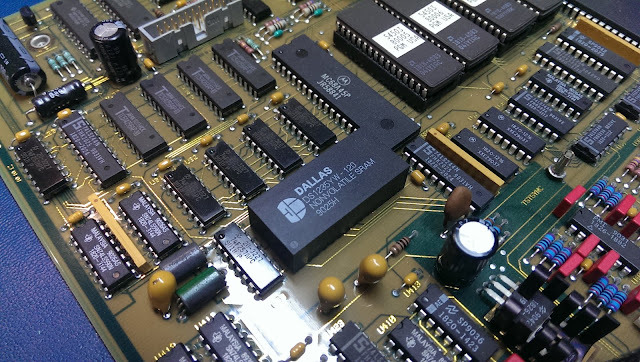 VHDL, RF, DSP, PIC, Digital, Analog, plus anything I find interesting at the moment. 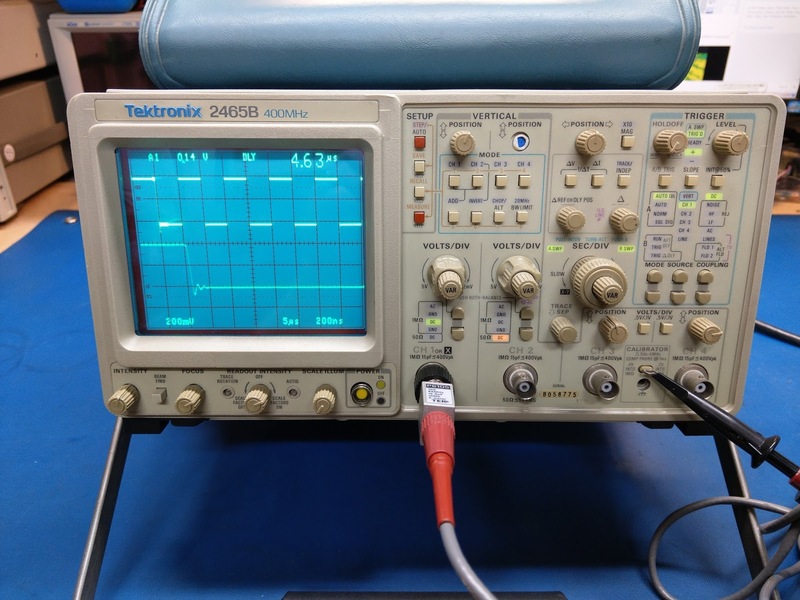 After a couple months I finally found some time to revisit my sad Tektronix 2465B auction find. At this point the power supply was rebuilt, and I had isolated U950 being a culprit by grabbing good hybrid ICs out of my working 2445B to test. Once the replacement U950 arrived it was placed in the 2465B which solved the numerous display issues and returned a horizontal sweep. To make matters worse, while troubleshooting I did not have one of the hybrids (U700) lined up exactly correctly after swapping it out from my 2445B. As a result of this when torquing it back down very lightly I heard a terrible crack. The edge of the ceramic board inside the hybrid had caught on the connector mounted on the board and cracked the hybrid substrate. So this would also have to be replaced because of my own mistake. I still had a good U700 from my 2445B for testing until the new hybrid arrived. Luckily these are cheap. A new issue was apparent at this time involving the horizontal sweep and possibly trigger systems. At low sweep speeds the scope would behave correctly, a nice sweep would occur with a waveform being properly triggered. The issue I was seeing involved at higher sweeps above 1ms/div. At these speeds the horizontal sweep would intermittently show up, sometimes not being visible altogether. If a signal was present I could get a waveform to display for a single sweep when changing either the sweep speed or trigger options. Researching into the issue I could not locate anyone who had this exact issue on any forums, most issues with horizontal sweep resulted in people just recommending to replace various hybrids. I knew this was not the case for me, looking back to the service manual(s), there was no exact description of this issue. At this point I began following the troubleshooting flowchart for the horizontal section item by item verifying voltages and waveforms. With everything looking fine, I was beginning to reach desperation as there was not much more to check. Towards the end of the flowchart there was a test involving removing the plug to J102 which is a ribbon cable that runs to an option board. This specific option board was for TV sync options which I really have no need for. Testing this I removed this connector and powering on the unit resulted in a fully functional unit, sweep and trigger was now working at all time divisions. All issues were now gone. I really don't care to look into repairing this TV option board, pulling it out didn't show any obvious signs of problems. I don't plan on needing to troubleshoot NTSC waveforms so I am just going to leave it disconnected for now. Some last items that I need to look at are trivial. I need to replace the scale illumination light bulbs, with 2400+ hours on the scope, all three are burnt out. I need a replacement knob for the channel 2 vertical position. This has actually been harder to find than I expected. Being patient I'm sure one will show up on eBay soon. The last issue will require some more investigation though. The traces themselves are slightly fuzzy, not a crisp trace like I see on my 2246 or 2445B. The rest of the display is perfectly focused, on screen menus look nice and sharp. 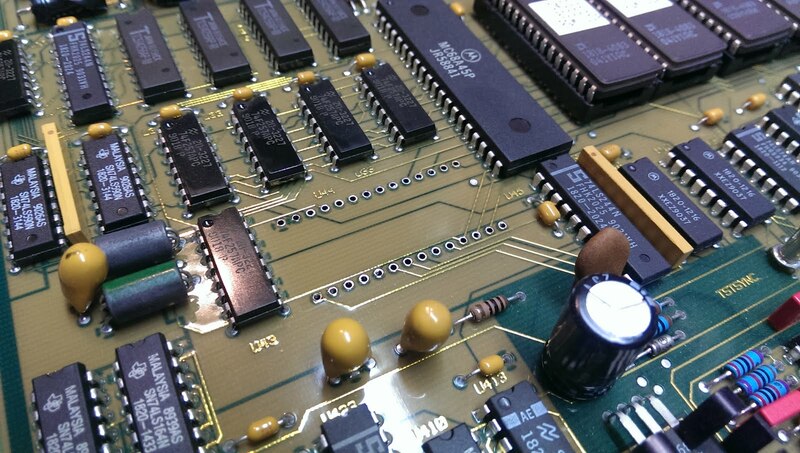 I adjusted the focus, astig, and the gain + focus knobs on the high voltage board, none of them helped the traces. So not quite sure about this one. It's not a super big issue but still bothers me somewhat. As a final note I will need to get some proper Tektronix probes for this scope, my P6105s are not designed for this 400MHz bandwidth. Recently and randomly I was notified from a friend about a local company liquidation auction for a local Unisys facility that was shutting down. Hoping to score some cool old vintage computer hardware I scoured the item listings to no avail. Nothing was really of interest, a lot of office furniture, shelving units, misc bins of random hardware bits. Ten years ago I would have been all over this auction, bidding on random carts of hardware to see what I can find but I just don't have time or the space for that anymore. After looking at a hundred or so pages of auction photos, one thing did catch my interest. 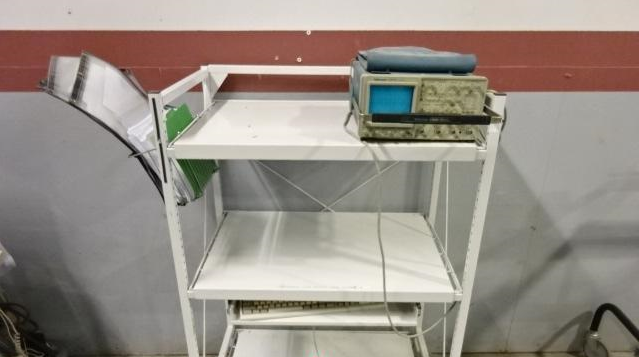 Hiding on an equipment cart was a Tektronix 2465B, sitting all by itself, the only piece of test gear in the entire auction out of hundreds of lots. I'm sure it was dead, the odds of it working and still being there were very unlikely. 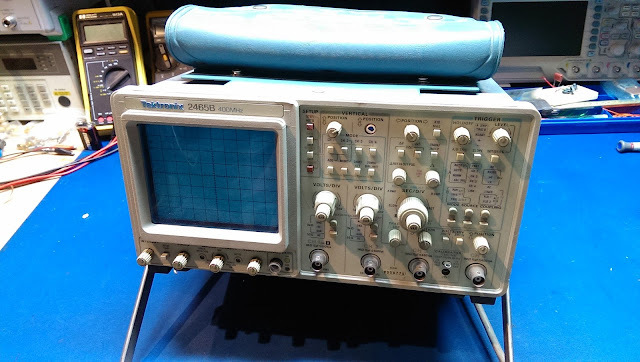 Having a 2445B, I have always wanted a 2465B, being the top of the line version at the time only second to the 2467 with its microchannel plate CRT. I ended up winning it for like 50 dollars including the cart which actually ended up being a really nice heavy duty equipment cart. Even if this scope was totally toast, it would still be a win for parts. Once I actually picked up the scope and had a good look at it, it was in pretty good shape. The only physical damage was the vertical position knob for channel 2 being broken off, but this was visible in the auction picture. The rest of the scope was in really good condition, clean with no other physical damage. 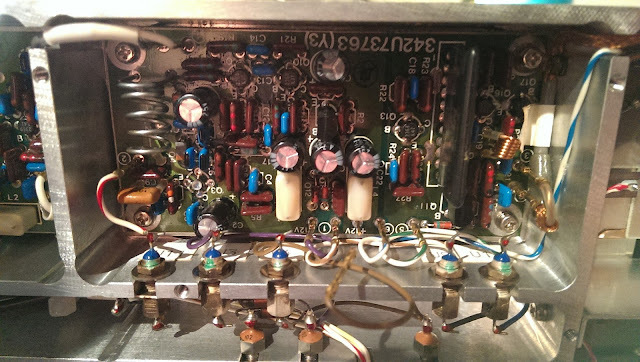 Having restored my 2445B and knowing this will need a full re-cap, I ordered all the replacement caps for the power supply and A5 PCB boards. The power supply for the entire 24NN series was basically identical with a few minor revisions. One thing I did notice though was some of the capacitor values were different in this 2465B compared to the capacitor list I had for my 2445B. Instead of placing the order based on my old parts list, I created a new list based off the values in this scope. Some parts on my old DigiKey list were no longer available anyway. Note that I ordered a few extra values of some of the caps to meet price breaks. Total cost came to $30.02 without shipping. 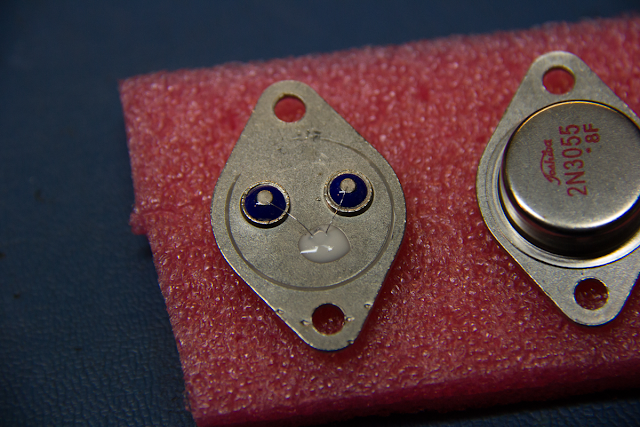 Just like on my 2445B, I always use high quality Panasonic 105 C caps and original replacement RIFA film capacitors. The couple non-polarized caps are 105 C Nichicons along with the two large filter caps. None of the resistors in this power supply were damaged like on my 2445B, so I left them alone on this one. For my first power on test, the scope did power up, went through the first self-test cycling the panel LEDs, fan was running, but nothing on the CRT. Intensity controls had no effect. Even the graticule illumination was dead. Timebase, channel, and trigger controls responded to changes so the digital portions were at least working. Checking voltages, some were off and had ripple so I powered down and would wait for the capacitors to arrive. Once all capacitors were replaced, powering up had the same result as before. Checking voltages they were all in spec now and the ripple I had was gone, but still no display. Time to reference the service manual. One note on the 2465B service manual, I found three different versions all of which having some slightly different information. None of the info contradicted itself, just some manuals had more information than others. Once of the manuals looked to be for the older version of the 2465B where the A5 pcb was not using surface mount components, this was for early serial numbers . The other two looked to be newer. I ended up referencing all three throughout the repair process. Following the troubleshooting flowcharts in the service manual, I ended up adjusting the grid bias adjustment which when increasing did give me a working display. Traces appeared along with on-screen graphics, but they were out of focus and had horizontal artifacts across the display. Intensity controls had no effect leading me to believe it was something with the Z axis processing based on the service manual flowcharts. The primary culprit would be the U950 hybrid which handles most of the Z axis functionality. 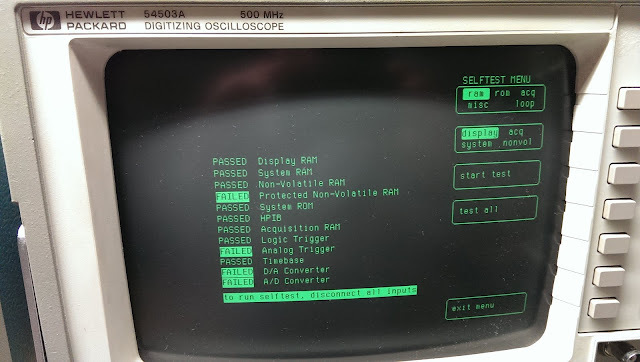 Since I did have a somewhat readable display, at this point I was able to run the self-test routine outlined in the service manual to verify the rest of the functionality. In doing this, the scope passed with no issues, so good news there. I could also check power-on hours and cycles, 15703 and 2440 respectably. About 5k more hours than my 2445B but still not a high amount compared to some 24NN's I have seen that are well over 30K hours. At this step, having a working donor scope makes troubleshooting significantly easier. 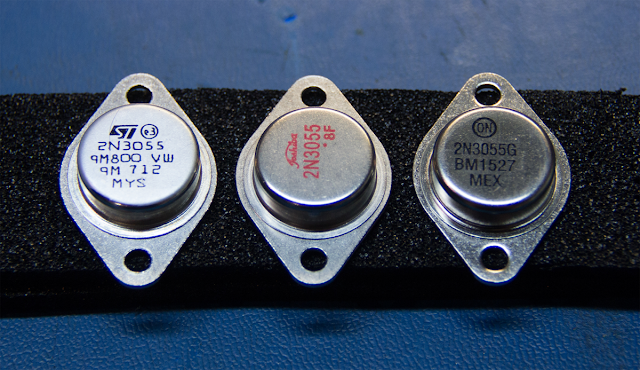 All of the hybrid ic's on the main board are identical, with exception to U600 which has a different part number. 165-2393-00 on the 2445B and 155-0237-00 on the 2465B. Reading into this, they are compatible with the exception being that the 2445B version does not have 400MHz bandwidth. So I can use it for testing if necessary, it will just limit bandwidth on the 2465B to something under 400MHz. You would not want to use this long term in the 2465B. Pulling parts from a working donor scope is always a little scary, I could end up with two non-working scopes in the process but parts are now plentiful on eBay for reasonable money. Swapping U950 from my 2445B to the 2465B did fix the display issue. After turning the grid bias back down, the intensity and readout intensity controls now properly function. The display has a nice clear readout and clean trace. Looking on eBay, a working tested replacement U950 is about $50 - $60 which has been ordered. Checking the rest of the scopes functionality I did notice another problem. As I adjust the horizontal timebase, the trace will disappear after increasing it beyond 2ms. Turn it back down and the trace will reappear. This behavior repeats for all 4 channels and is Y axis independent. Applying a signal has no change on behavior. Either the built in square wave calibrator or an external signal from a signal generator, the scope will lose trigger right around 2ms then have no trace at all beyond 1ms. Changing any setting, 20mhz bw, delayed timebase, other triggering options, etc made no difference. So something is up with the horizontal timebase and / or triggering on this scope. One first attempt was to swap out the remaining hybrid ic's from my 2445B to the 2465B to at least eliminate another one of them being a possible issue. This ended up making no difference, so the next step will be to go back to the service manual. Their is a lengthy flowchart to debug horizontal trace issues, following this will be my next step. I'll leave this for a part II of the repair. I recently needed some 2N3055 TO-3 transistors for a project, but could not locate any around my basement, so I went ahead and carefully purchased some from eBay. I'll explain what I mean by carefully, a little back story on this before I continue. 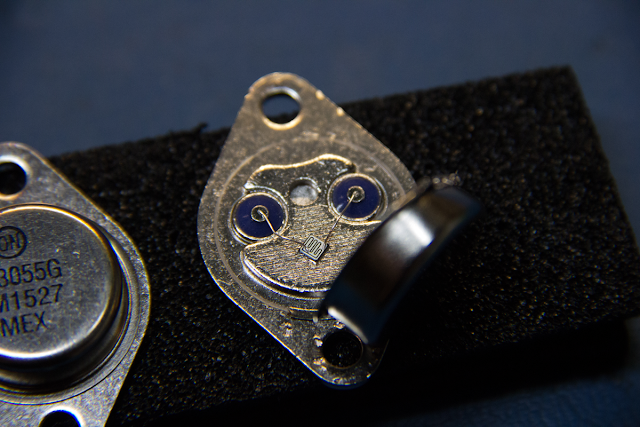 Counterfeit components sourced from eBay is not a new thing or a surprise. I don't think that I would be wrong in saying that most components on eBay are a no-name brand from Shenzhen, if not actually counterfeit. Now if you know what you are looking for specifically and don't just buy the first thing that pops up in your search results, you will be fine. Plenty of components from China are just fine, LEDs are a good example. I have LEDs of probably every wavelength available in bags by the hundred that cost next to nothing from China, all from eBay. Many have been used in projects running for years without issue, for items like this I have no issues with cheap components. But when I'm expecting a legitimate transistor sold as a name brand, and get a knock-off cheap piece of crap there is an issue. As I have learned, TO-3 transistors for whatever reason are a very popular thing to counterfeit. So back to buying my transistors. 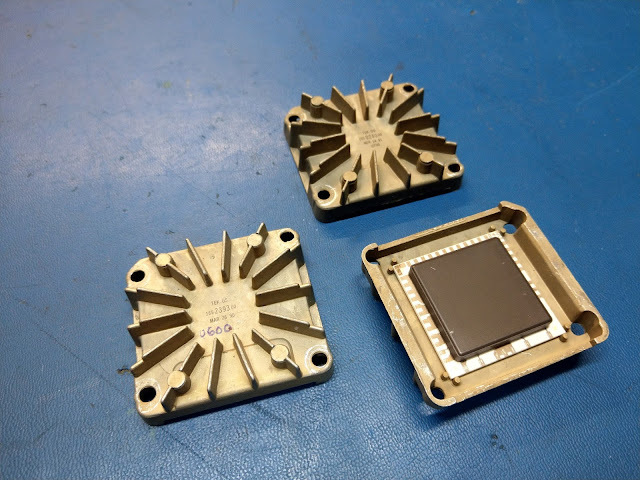 Fake transistors are usually easy to spot visually. The cases are always shiny, the label on the case is usually crooked, or blurry from the poor printing process that is used. The type fonts are often weird. They just look cheap. So I first picked a few ST Micro 2N3055s that in the auction picture looked like original OEM transistors comparing to other TO-3 style transistors I had around. This was from a US seller with a good reputation too, everyhting looked legit. I had them in a few days, what I received though was not the same transistor shown in the picture. It looked wrong, it felt wrong, everything was just wrong about it. I purposely avoided all of the listing with transistors that looked like this as I knew they were counterfeit but ended up with them anyway. To test for a counterfeit transistor, first just see if you can rub the label off with your finger. The label on this transistor came off with little effort just by rubbing on it. A stronger test is to use some rubbing alcohol, a real transistors label will not come off even with alcohol. Also look at the date codes, most counterfeit transistors will have a misleading date code or just be non-existent altogether. A tiny little die glued down with some white stuff and tiny little bonding wires, really pathetic. My favorite feature is the surface rust seen on the inside of the can. I wonder how long this case was sitting around before someone manually assembled it. The ink rubbed off on this one just as easily, the can popped off almost with no effort. There in fact wasn't even any damage to them when I removed it, a clean break. And inside, this one was even better. Similar construction, and the bonding wires! Oh my, even smaller than the previous labeled ST transistor. At this point I could keep buying them seeing if I could find anything legit, but I decided to cut my losses and just get the real thing. I ended up contacting the sellers of the transistors from eBay just to see what their response would be in telling them that their components are most likely counterfeit. One seller actually seemed to care and began questioning his supplier, whether or not he actually will do anything about it is yet to be seen, the transistors I bought are still available by him. The other seller didn't seem to care at all and simply said I could return them if I didn't like them. I will also note that all of these transistors did work, although I have not tested them at higher currents which is where most people say they will fail. Either way I don't trust them and wouldn't use them in any serious project. It seems the counterfeit market for these is much worse than I had expected. This didn't look good. An important key to the cause of the failures was the failure of the Non-Volatile ram. 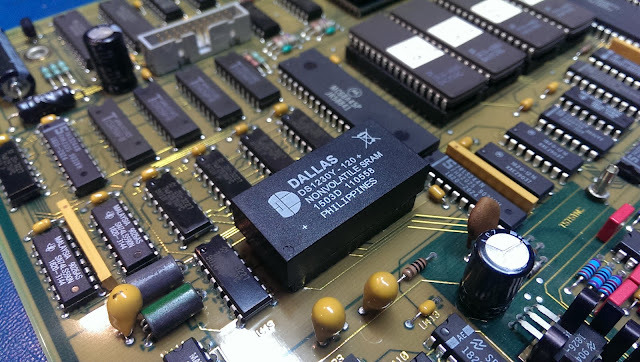 Most older equipment like this used a Dallas Semiconductor real time clock / NVRAM IC to store the calibration data along with waveform storage. In this case it is not a real-time clock, just a battery backed DS1235YW RAM ic. This classic chip has an internal battery to backup the contents inside, technology that existed way before inexpensive flash memory that has a limited lifetime. Based on the manufacturing date on the late 1980s, this ic was almost 30 years old, way beyond its expected lifetime but about average for how long I see these devices last. 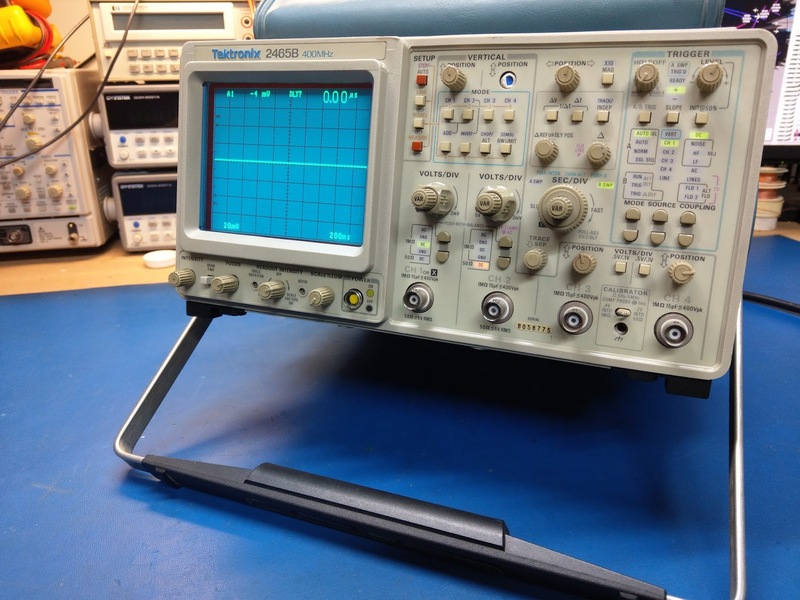 The HP 5450NA family of scopes 54501A, 54502A, and 54503A are really nice scopes readily available for cheap. My favorite part about them is the interface, it is intuitive and lightning fast. Response from button inputs is instantaneous, unlike many modern scopes which makes it a pleasure to use. This was definitely getting repaired. A quick way to check to see if the NVRAM is indeed the issue is to flip the write protect switch on the back of the unit off and attempt calibration. Once you calibrate this scope, you flip this switch to protect the contents from accidental writing, but in this case I want to re-calibrate it and to do so you must enable writing. Once this switch was changed I ran the calibration procedure for channel 1. It calibrated successfully and brought the scope back to a working state. So this was the only problem and the NVRAM ic will need to be replaced, unless you feel like going through a full calibration every time you power the scope on. Since a full calibration of all channels takes around 25 minutes, this is not ideal. Removing this ic is pretty easy, use a nice fat hot iron and some fine solder wick and the ic falls right out with no damage to traces. As far as a replacement, the original DS1235YW is not easily available, but the pin compatible DS1230Y is available. It is still made and Digikey sells it for $30. Then there is the eBay source of them direct from China for only $5. While the Chinese version is guaranteed to be a knock off, it does work as I have used them before. I went ahead and used one for this replacement since I have a few laying around. Once replaced and everything is back together, calibration is the last step. Set the write protect switch to off and run through all the calibration procedures. The calibration for this scope requires a 50ohm bnc cable to be fed from two outputs on the back of the unit to each channel is sequence, the scope really walks you through everything. The manual will explain all of this as well, but is really a simple procedure and a really nice feature. When done, set the switch back to write protect, test it out and power cycle it to verify all calibration was held. Good as new. With the 2015 September 10GHz and up contest approaching fast, I am in process of making some performance improvements to my 10GHz station. I had already missed the first round of the August 10GHz and up, so I wanted to make sure to complete a few necessary items before the 2nd round is here. Phase noise is shown here on the left with the original noise regulators, and a much cleaner output is shown on the right after the low-noise regulator replacement. Next item on my list was to add some additional attenuation into the LO path that drives the mixers. Originally when I had a phased lock PLL brick, LO drive power through both outputs was approximately 12dBm. This was ideal for the two Magnum Microwave mixers I was using. After switching to the PLL synth and x4 multiplier, my output to the LO's through a splitter was a little hot at 15dBm. This was the upper max limit of power in the datasheet. This as a result was causing some additional spurs on the RF side, which while immediately filtered was still resulting in some spur leakage. 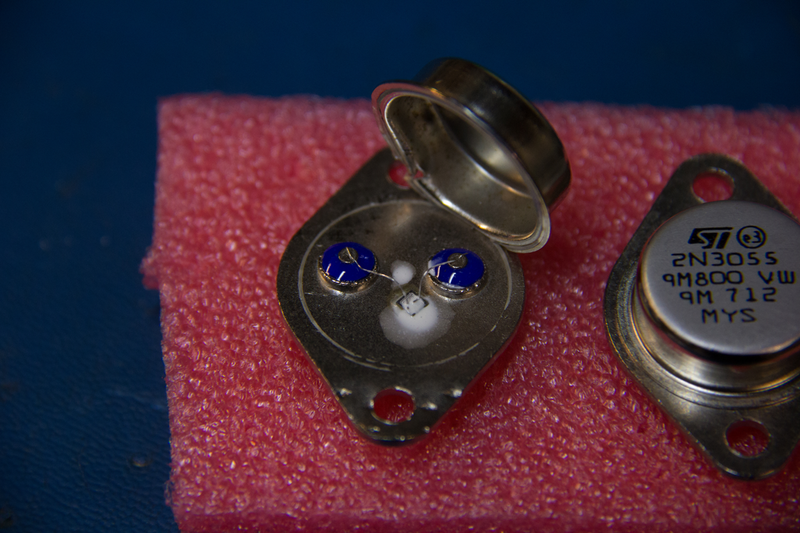 A 3dB pad in line with the output of the x4 multiplier cleaned the excessive spurs up nicely. 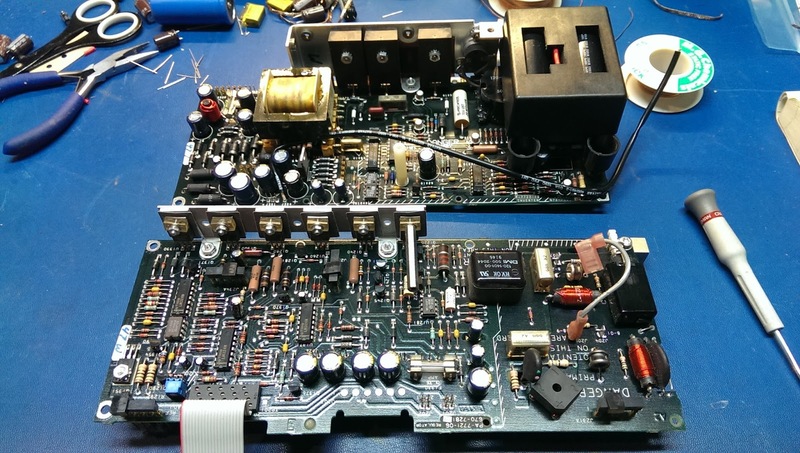 The final improvement is in regards to the actual frequency reference itself for the LO PLL freq synth. I had designed my synth to use an on board TCXO protected by a shielded enclosure for both rf shielding and hopefully help stabilize the temperature. Temperature drift is critical in any design, this one was particularly touchy to temperature. When the synth was running and locked to my 2556GHz output frequency, simply blowing air across the TCXO caused the output frequency to start drifting. The specs for the particular crystal I had chosen were not that great at ±2.5ppm over the specified temperature range, I would definitely need to do better for good stability. I have a rubidium 10MHz reference I use at my bench. I didn't want to devote this just for my mobile station as I use the reference for all of my test equipment. I would also need to frequency double it to work with my ADF4107 PLL as it requires a minimum 20MHz reference. As a compromise, I decided to go with a crystal oven oscillator (OCXO). I had a 20MHz version available that runs off of 12V which will be perfect for this mobile 10GHz station. Details of this will probably be in a separate post due to the difference being pretty interesting. I recently acquired a nice Anritsu MF76A 18GHz frequency counter in a non-working state off of eBay. While older, this is still a very usable counter that goes for quite a bit of money when working. This one sold for cheap so I figured why not, I'm sure I'll be able to get it working. I didn't really need it as I have a good EIP 545A 18GHz counter, but this one looked fun to fix. 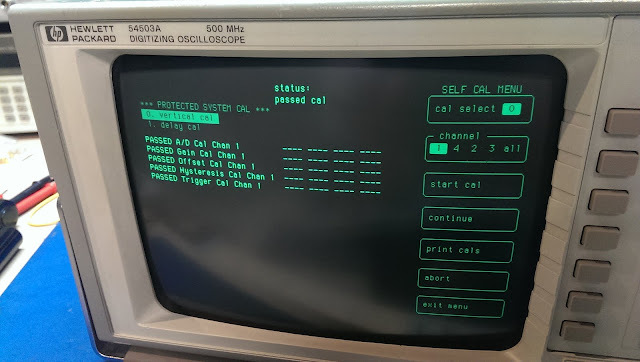 The images of it indicated that it was powering up and had the cpu portions functional as the display went through its power up cycle and displayed all zeros on the display. Typically with frequency counters in this state and not counting, you either have a failed 10MHz reference or a damaged front end from over-driving the input. I was hoping for the former as I already have a stable rubidium reference I use with all of my gear. Anritsu equipment is notoriously difficult to repair due to the lack of service manual availability. I ran into the same issue with my second MT8801C communication analyzer / spectrum analyzer that I had purchased in a non-booting state. I was ultimately able to acquire a service manual for it but it took some serious searching and asking around. Once I obtained it, it was nothing like the older HP and Tektronix manuals I was used to. 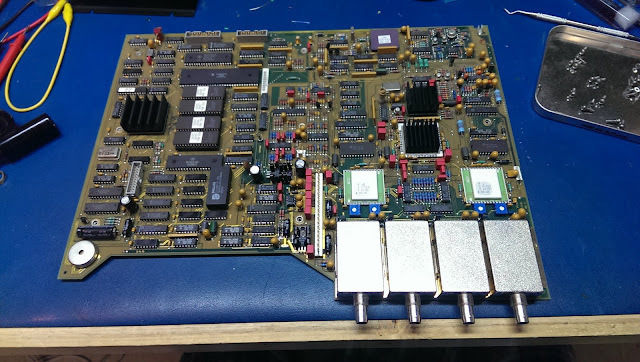 This manual went through a basic troubleshooting process to identify the issue to a board level, no further schematics or information was available (in the manual I had anyway). Upon arriving, I powered this MF76A up on the bench, it was in good overall condition and did power up as it was supposed to. 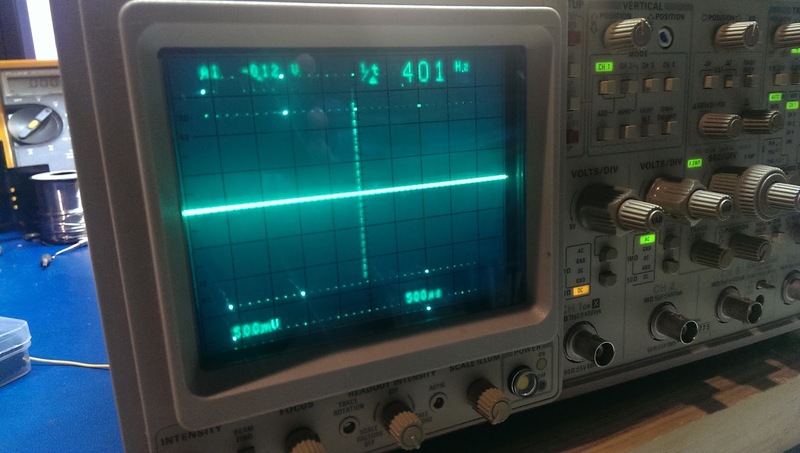 Upon applying a RF source to either the 200MHz or 18GHz inputs resulted in no counting. In a way this was good, it could indicate an issue further down then the first converter stages. The back of the unit has a switch to either output the internal 10MHz reference or accept an external one. Checking this with a counter, the internal reference is working as expected. Damn. Time to open it up. The back of the unit had the calibration stickers broken which was expected, this came from a calibration house / test equipment reseller and I'm sure someone mucked around inside with some attempt to repair it. With covers off, everything looked at least complete, this unit was constructed very nicely. The power supply is tucked into the back of the unit, not the easiest to reach to check voltages, but the power comes off of it and is transferred to the backplane which has wider traces for increased current making it easy to identify. There are no voltage markings or test points on the boards but it was pretty easy to determine which were power. Probing voltages, everything looked fine except for one strange voltage reading which was around +6.8 volts. Also noticing that a -12V rail was present but no +12, I was betting that something simple like a bad cap was holding the +12V rail down to +6.8 volts, very similar to my EIP 545A repair. Pulling all the boards and reinserting them to locate the source of the issue resulted in the +12V voltage drop being caused by the input IF brick at the front of the unit. This was fed directly from the 18GHz input, the 200MHz input bypassed it and went right to one of the digital boards. 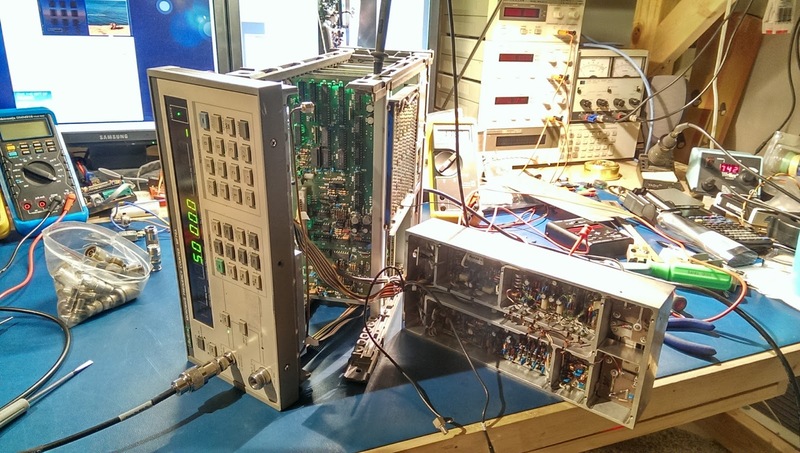 As a test I left the 18GHz section unplugged and ran a 50MHz source into the other input. At first there was no response but I realized that one of the coax connectors coming off of the 200MHz input was not connected in the correct location. Whomever had been in this unit messing around didn't put it back together correctly. Once it was where it was supposed to be, success. 50MHz displaying correctly. So the counter itself is working fine, just the 18GHz converter is causing problems. This was always a concern, you see this often from someone providing too much input and damaging the input section. So while 200MHz is great, 18GHz is why I wanted this counter. At this point I pulled the input brick out and started taking the covers off of it. The cables for this are long enough to allow you to work on it outside of the unit, I so love designs that allow for repairs. Each side of this brick was made up of multiple boards all of which actually had labeled power input pins. This made locating the problem board very easy. 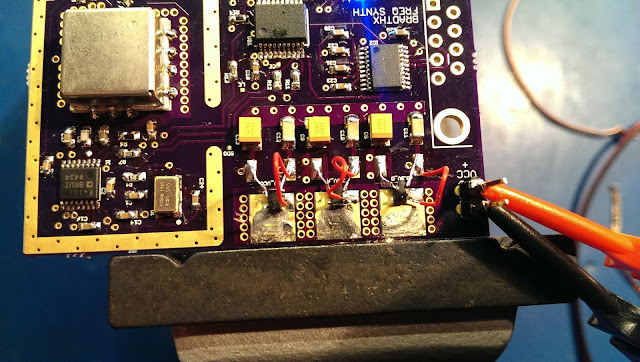 Measuring +12V to ground I was reading roughly 1.2K ohms through all boards. Through process of elimination I was able to isolate the boards that were sinking the +12V down to two boards, both exactly the same. Pulling the +12V cable off of each board returned the rail to normal levels. Both boards were labeled '342U7363', each containing a handful of passives, some transistors and MMICs, along with what looked like a large thick-film precision resistor. By following the traces on the board and divide and conquering by cutting some traces, I discovered the +12V sinking was actually coming from this large mystery device package. Looking it up, it is an NEC MC-5156 broadband amplifier in a sip package and was nearly shorted from vcc to ground. Removing these two amplifiers from each board returned the +12V rail to normal, so these two parts were at least indicating to be bad. Was anything else bad? Maybe, it is hard to tell for sure and without a full schematic it is really difficult to trace the signal paths between these boards to guess what else may be blown. Luckily these old amplifiers are still available as NOS from some suppliers, so with two ordered we shall see. Right now with these two amplifiers removed, the unit powers up and counts correctly on the 200MHz input. I am also able to see some RF on the input to each now missing amplifier, so RF is at least getting that far. Is this the only problem? Maybe, maybe not as this would be too easy. I'm betting there are more issues than just this but I can't do any more at the moment until the replacement parts arrive. I have posted several times in the past on the PLL frequency synthesizer I designed and built based on the Analog Devices ADF4107. 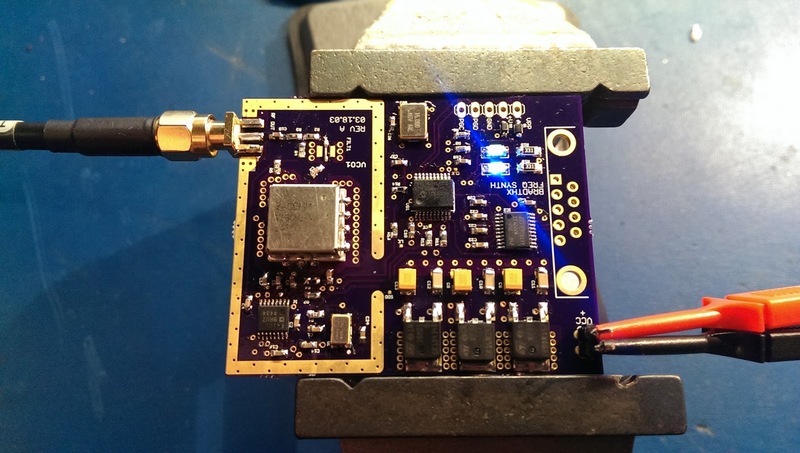 The overall design is a platform for a fractional PLL frequency synthesizer for any frequency range up to about 5GHz. A single frequency or range could be generated simply by changing out the VCO and loop filter and reprogramming the ADF4107s registers. The design overall has worked very well, I have used it as a LO for a 1.42GHz hydrogen line radio telescope, a 2556GHz LO for my 10GHz ham station, and a 5.4GHz LO for some specific satellite downlinks. One element of the design that has been less than ideal was the devices phase noise. My specific PLL was on average about 10dB to 20dB under spec of what the documented phase noise should be for similar designs using the ADF4107 and Z-Comm VCOs. After reading to the application notes some more and a recommendation via twitter from Tony (KC6QHP) who suggested looking into using very low noise regulators for the design, I decided to make the change. The issue I now have is I had designed the board for standard DPAK package regulators, the ADP150 used tiny TSOT packages. Because of this I would have to be creative in mounting the devices in the DPAK footprints. This turned out to not be too bad of a task although not the most elegant solution. The results speak for themselves, after replacing the regulators with the ADP150s, phase noise has considerably decreased. I have already started on a version 2 of this synthesizer and I will be definitely switching to these regulators for all future versions. 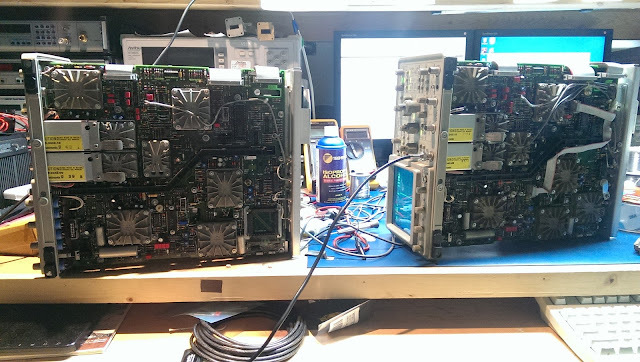 Standard KF33 and 7805 regulators on the left, low noise ADP150 regulators on the right.